[*]Spent the majority of this year renovating a fixer upper and now finished and moved to our new house. I have started tracking my financials into detail since last month. I have always had an idea of our income and expenses and I know that we easily make more than we spend so I never felt the need to go into detail on it. Now that I have one full month in my detailed administration I figured I could start a journal. This journal will help me to stick to my ERE plans because I would feel somewhat responsible to do so because of the audience. Obviously I hope I can inspire you readers as well, but even if I wouldn't get any replies I would try to continue to post here. Regarding pension: I have been paying enough to get company match but in this country you cannot really do anything with your pension until you reach the age of 67, which is for me 42 years from now. Because we have a stable income every month and no grand expenses to be expected we have no reason to be worried right now, but obviously we are very far from FI/RE. So with all the expenses around the renovation of our house, moving, taxes etc we basicially didn't save any money this year, but at least we have our own family home at the age of 25 without any major loans or debts. So what was November like in statistics? So nothing ERE-worthy yet, but since this is my first month I am quite happy especially since these are the statistics for a month based on just my income because my wife's income for some reason will come one month later. If she would have gotten her salary already we would have been at 25-30% Savings Rate. Apart from that I think my expense forecasts were very accurate, and last but not least: we saved three times more than I expected because of unexpected income extra's such as a refund on our water bill. This month I expect a SR of around 30-35% because we will have double the income of my wife so that is nice too. With my kind of job it is realistic to believe that my income will increase significantly over the years, since I am only 25, so having these Savings Rates already in this phase of life with no grand expenses to be expected I am very very pleased. 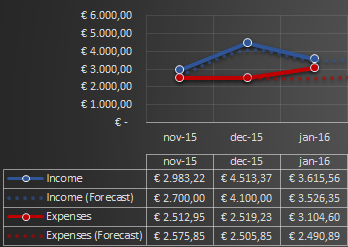 My next post will contain some graphs and stats on my income and expenses, and also a long term forecast. Keep blogging dude. Will be interesting to follow your journey. As promised I would provide some detailed statistics and graphs. Dotted lines are forecasts, solid lines are actuals. As you can see our net worth is forecasted to increase to about 13k by the end of 2016. We still expect to have some garden renovation costs over the course of the next year, since that is something I havent had time to do since we bought the house. The garden is a very dangerous environment for our daughter right now. The plan is to have a lot of edibles, a porch and a little greenhouse by the end of the year. The average savings rate is around 25% next year. Expected to increase every year as you will be able to see in our 15 year forecast below. As you can see our savings and investments will be increasing significantly over the course of the next 10 years, after that I plan to pay of the remaining mortgage of the course of the last 5 years. After these 15 years I should be able to retire parttime, if I were to work for 3 or 4 more years I would be able to quit entirely. I have tons of spreadsheets to back these things up, and lots of other graphs as well but lets save that for another day. Anyways, a long road ahead. Last edited by NickHalden on Mon Dec 28, 2015 4:38 am, edited 1 time in total. Ha, fresh graph material, nice! What does the crowdfunding portion mean in your 15 year forecast? henrik wrote: Ha, fresh graph material, nice! I plan on allocating a small portion of my savings in crowdfunding platforms such as lendahand, and the Dutch equivalents of them. As stated in my introduction I work as a department manager with a medium sized Dutch software company. I work there for 3.5 years now. A bit of history: I started right out of university as a junior software engineer. After 7 months I was promoted to project manager, responsible for designing, building and implementing a new ERP system (the biggest kind of software that you can imagine, it covers basically all the processes in a company) with a top rated UK investment company. With the help of my team members I succesfully completed that project (and a few others) over the course of 2 years. 5% increase in base salary (so monthly salary of 3,008€ will go to 3,158€ before tax. After income tax it means +80€/month extra). Training fund to get online courses from the Wharton Business School. I am quite over-ambitous but I am happy with the above. Those of you not familiar with typical Dutch salaries in combination with the same kind of education background and working experience: it is safe to say that my income is roughly 20% higher than my peers (e.g. old class mates). Of course this also comes with more responsibilities, but hey, that is what I like. Hi all, one day early but not expecting any changes tomorrow. My wife's delayed pay checks finally came through and they were a bit higher than anticipated, so was my income because of reimbursed traveling costs. First time you see a breakdown of my expenses. Perhaps it hurts to see the transportation costs, but please note that about 50% of these costs are reimbursed by my employer. Apart from that it is really not possible to not have a car in my position because I often have to get to the other side of the country very early in the morning. Anyways, even though christmas time tends to have more unexpected expenses, it evens out pretty well. We spent around 100€ (~110$) by cooking two fantastic christmas dinners for my parents and my in laws. We spent 15€ on a gift for our 1.5 year old daughter but we agreed with the rest of the family that there is no need to give eachother any further useless gifts, and we still had a great time. Only other big expense that I did not foresee was a new winter coat (200€), a high quality one that should last for a long time. Of course starting small, I could technically invest more but I first need to build up an emergency fund. [*]Bought an electric razor/scissor set for 50€ set so we can do most of our own hair cutting now (saves about 100€ per year). [*]Health Insurance coverage changed to a higher financial risk but lower monthly fees. Since we never visit the hospital and rarely need any meds this will most likely save us around 420€ next year. If this will go completely wrong healthwise (e.g. my wife and I both end up in the hospital) this modification will cause a maximum unexpected expense of around 750€, but that is not very likely. January was not a good month. We had a few unexpected expenses and splurges. Also my wife made less money as she was unable to work because of the christmas holidays. Also my raise did not come through until february (but will be corrected for January). The above is reflected in graphs below. Saved only half of what we expected. February was a good month. We spent 800 euro less than last month, and both my new raise and correction for January came through. We made 5% more income than expected, and we spent 6% less than expected. 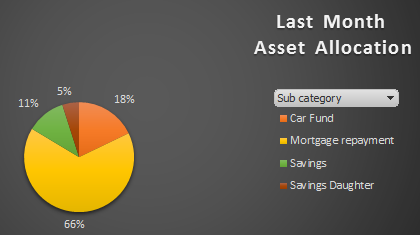 So we managed to get a savings rate of 43%, which is a above average for us - plus I am quite proud of it considering I am only 25 years old, my 25 year old wife is only working part time, and we have a 1.5 year old daughter - and one baby on the way. I can only imagine what more is yet to come in the next years. We live in our new house since September 2015 now. Here in the Netherlands it is normal that the electricity/gas supplier estimates the total amount of costs in advance of the following year, and divides that total number by 12 months and that is what you pay monthly. At the end of every year they calculate the actual amount and the difference will be reimbursed or charged. We got about 50% of our electricity and gas costs for the last 4 months of 2015 reimbursed, because we apparently spent only 50% of the average household with a similar type of house. But please note that these months are pretty much the coldest months of the year, so we achieved to spend 50% of what normal people do on average in an entire year (including summer). I ofcourse knew this already because I have a nice little device in our house that shows exactly how much you are spending every minute, and I export all these statistics to my spreadsheet program but still nice to get all that money back. This is reflected in last months savings rate because they didnt want us to pay at all for this month because of all this. Still another 160 euro is going to be transferred to our accounts next month, so that is promising as well. I changed both car insurances, saving about 50% (or 60 euro) per month, simply by using a comparison website and choosing cheaper options. I barely got any noticable changes in coverage, just a little less legal advice if I am unable to sort it out with the other party in the case of an accident. Well I figured I am quite capable of sending formal angry letters myself as well. All this resulted in a net worth increase of 1866 euro (8% above forecast, even though we were slightly under last month! ), reflected in the graph below. Net Worth is now 5469 euro. First time I had enough money to play around with investing. 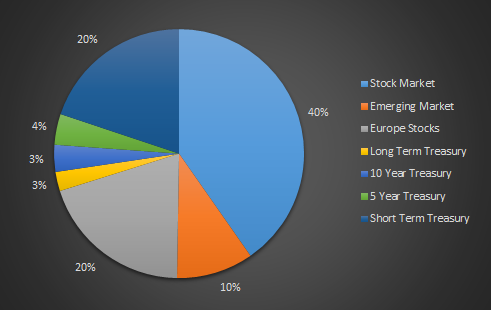 I made a 100 euro investment into several trackers, allocated as per the graph below. This process is now automated, so every month I will automatically invest into funds as per the allocation in the graph. Anyways, hope you guys like it - even though I do not (yet) make sacrifices some other people do in other get even higher savings rates. 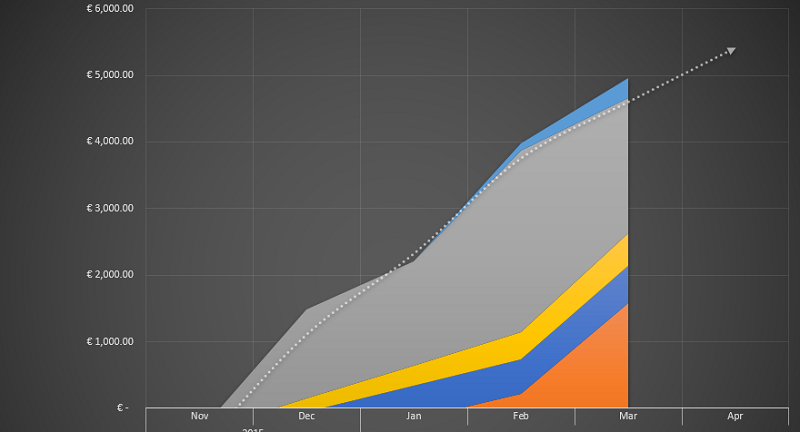 Also made some new graphs that I like better They are losely based on some other users' graphs here. Changed the graph so that it no longer includes historical forecasts. In orange it shows the current month, and the transparent months are future months based on forecasts. I can now dynamically set my graph to show an X number of future months and it will display them instantly in transparent bars. So for us this is a pretty good month in terms of income. Expenses were also quite good, but I had to pay over 600 euro in annual property taxes/water cleansing/sewage taxes. They are included in the graph as expenses, without them I would have had around a 50% savings rate. Made a house equity valuation mistake in previous chart, so have re-valued accordingly. In the end house equity does not really matter right now since we only just bought it and do not plan on moving but I like to keep track of our mortgage payments and investments. I made a pretty large investment (1300 euro) in replacing the single pane windows in my house for double insulated ones. This will lower my gas costs significantly. Apart from that I have taken the material portion of that 1300 euro and added it to the house equity because it does increase the value of our house as well. Also I invested a little more cash in index investments. So cash (grey) went down, house equity and investments (top blue) went up. Even though we burned some cash there we are still 8% up on our forecast (dotted line). New graph. The lightest blue bars reflect the years that we still need to work. The middle-blue represents years where investment income is higher than our basic living costs. Dark blue bars represent years where investment income completely cover all our expenses. In short everything in this chart is based on our current average YTD spending/income. 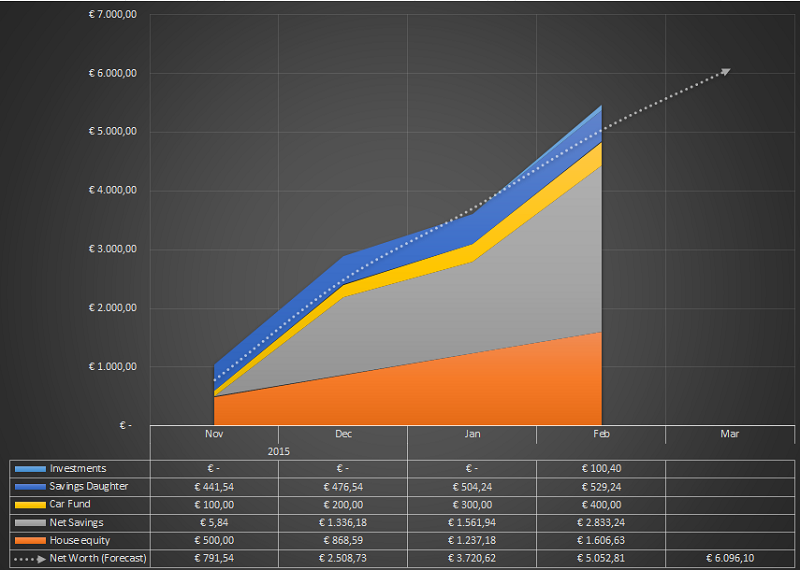 So if I enter a transaction of a 1000 euro's expense in the system, the average will obviously change, and the system assumes this is a recurring expense so the chart will change accordingly. I figured that there arent very many once-in-a-lifetime costs for us left, so this works fine. The idea is that this chart automatically gets more and more precise as time goes by. Next 2 month's will not be as good. Still a lot of taxes incoming, and I have to start spending money on our garden. It desperately needs a new fence (allthough our neighbour also has to pay 50% of that), and a new porch. April is already over, and we had a pretty average month in terms of saving. It was in fact quite a good month but due to some irregular expenses such as property taxes the expenses ended up a bit higher. We also prepaid some income tax for the next year. Income for April was also a bit higher due to the fact that my wife worked a bit more the month before and I had a few reimbursed expenses. But also I invested a bit in my financial literacy, by getting 6-months worth of financial newspapers. I did count this as an expense because I cannot measure nor estimate the return on this investment. Will evaluate later. Orange is the current month, May. It includes actuals (I update my database daily with all my new financial transactions), but also forecasts for the rest of the month. As you can see we expect to have a much higher income and savings rate this month. This is due to vacation money coming in from my employer, roughly 8% of a years salary. We plan to invest this in our house. There are a few quick wins that will really increase the value of our property, and also more comfortable living. Last month we performed slightly better than anticipated (Dotted line is our forecast). Net Worth increased from 4700€ to 6150€ in April. Nicely above the forecast (dotted line), but as you can see in the current month May we expect to return to our forecast. But we will probably make a nice jump to 8500€ this month, and also a few jumps in the months after that. I made a new feature in the graph so that it shows the net worth forecast slightly transparent so that I can always see what the effects of my allocations are. Is that Excel? How do you do your forecasts? Gilberto de Piento wrote: Looks good! It is currently Excel indeed. As a software developer I keep thinking about building better solutions but for now this works fine. "01/07/2016 Transport-Fuel € 50.00", "01/08/2016 Insurance-Health Insurance € 174.00", etc. I have about 2000 of these forecast transactions for the next 5 years. 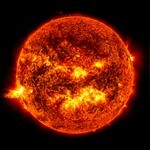 Of course they are more precise in the near future. In the end it extrapolates based on rolling averages. Very good month in terms of income. We got back a lot of prepaid income taxes - a few months earlier than anticipated. I have adjusted the forecast accordingly. Also we had our holiday allowance of about 1500€. In total we got almost 7k in net income after taxes. Always have been very interested in poker, but always hesitant to put money in it. So after grinding it up to high levels of play money I finally decided to take a shot with real money. Started with a 55 dollar deposit, and after a typical poker rollercoaster ride my bankroll is now at 150 dollar. I played about 40.000 hands, so you can say I am winning quite consistently and I am definitely looking to further move up the stakes. I consider it an investment, but I have never done this before But even if I sell the parts I should be making an easy 500€ or so. I have always found May/June to be a more expensive time than Christmas wrt parties, gifts, weddings, graduations, etc. The baby is basically responsible for the forecasted big income dip until october. After that I suppose it will cost us roughly 50€ per month extra for babyfood and diapers. If it is a boy it will probably be a little more, since we only have girls clothing/stuff in our house yet. 10.000 euro Net Worth Milestone !! Well... I have been at the 10k Net Worth before (first time when I was 18 years old). In the last 5 years my wife and I did a lot things that cost a lot of money. So when we married, bought a house and furniture, some very lengthy vacations, had a daughter and a huge house renovation later there was nothing left of that money. This time however will most likely be the last time to cross this milestone of 10k as we both really believe in this financial path that we now have chosen. After a few financial revisions May ended up worse than I originally posted last month. We did make some kind of comeback this month however. As you can see we (barely) passed the 10k mark, but we are still slightly under our forecasted line (dotted line). I expect to make up for this in the months of September and October where I expect slightly higher income than currently reflected in our forecast. And if we don't, well this is only just the beginning of our road anyways. Obviously income was a lot lower than last month without bonusses and tax returns. We only saved 18%, mainly due to booking a 850 euro vacation. Had we not booked that vacation we would be at 40%, even crossing our forecast line. We intended to spend less on vacation, but we have ultimately decided to pay a vacation for my parents and youngest brother as well. My family is unable to arrange a vacation themselves this year, and since I have joined their vacations a lots of times during my life it felt only fair to do something back. Played a lot of poker, but I am only slightly above breakeven compared to last month. Joined a poker club and improving every day. Nothin' like some big round numbers. Been on vacation for a week to Germany and I have been working for a week straight on building a porch. Net Worth did not increase as most of our leftover money was spent on the porch and new tools(500€), fixing the car (300€) and payment for a big rental dumpster. Also we ate out while on vacation a few times. 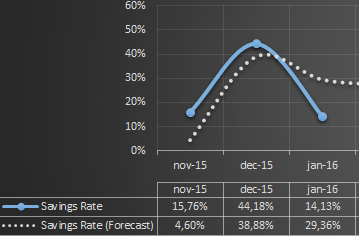 Result is a very bad savings rate of only 12% this month, and in fact a negative cash flow. Well this was due to happen and I trust the value of my house will increase accordingly with the new porch. The baby is due to be born in about 3 weeks, but my wife's new employment officially starts today. Obviously she cannot work so she 'starts' with the maternity leave. Actual start date would be in december so free money coming in until then This I did not account for in my forecasts so hopefully we will get back to our forecast line (dotted line) and perhaps even end a little higher than that. Last edited by NickHalden on Mon Nov 21, 2016 11:09 am, edited 1 time in total.